The Laboratory for Advanced Microscopies is a shared campus facility, and is affiliated with the Bates College Imaging Center. 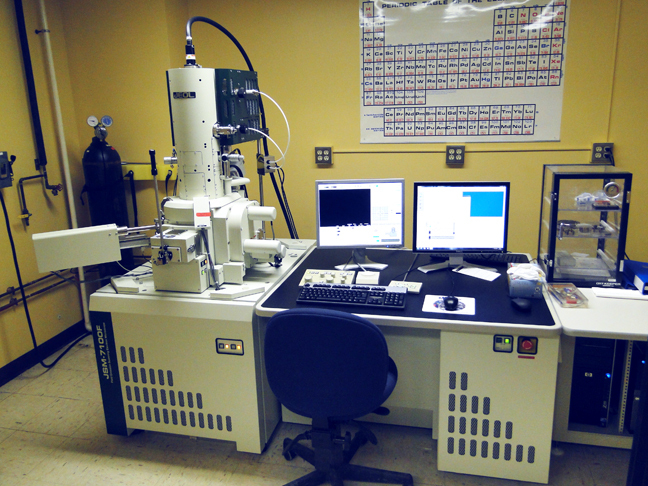 FE-SEM: The lab is based upon an analytical FE-SEM (JEOL JSM-7100FLV equipped with a Thermo/ Noran System 7 EDS System with a LN-free detector) and is used by faculty and students for research, teaching, and outreach programs in Biology, Geology, and Chemistry. Confocal Microscopy: A Leica SP8 Laser Scanning Confocal Microscope is utilized by faculty and students from Biology, Neuroscience, Physics, and Biological Chemistry in both research and teaching. The confocal was acquired with an NSF MRI Grant to Bates College (read more).